During every step of a run, your legs absorb up to twice your body weight’s equivalent in force. Your heel is one part of your body that takes on a lot of those forces. If you are suffering from heel pain, all that pounding can cause an excruciating amount of pain, almost to the point of not being able to run at all. The best running shoes for heel pain are heavily cushioned to absorb much of the pounding your feet take while running. If you are a heel striker (which the majority of runners are), you also need a high heel-to-toe drop to allow for a smooth heel-toe transition while running. 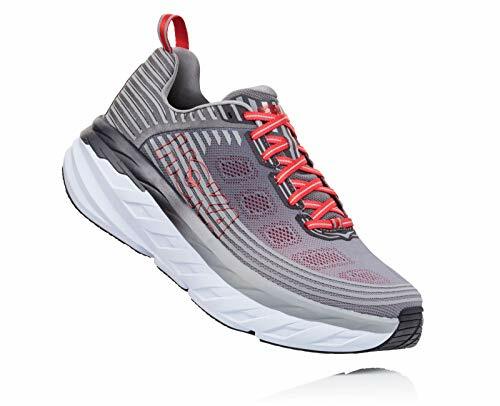 Our top selection, the Hoka One One Bondi 6, even has a rocker sole on top of a high cushioned heel to provide a smooth transition while running. 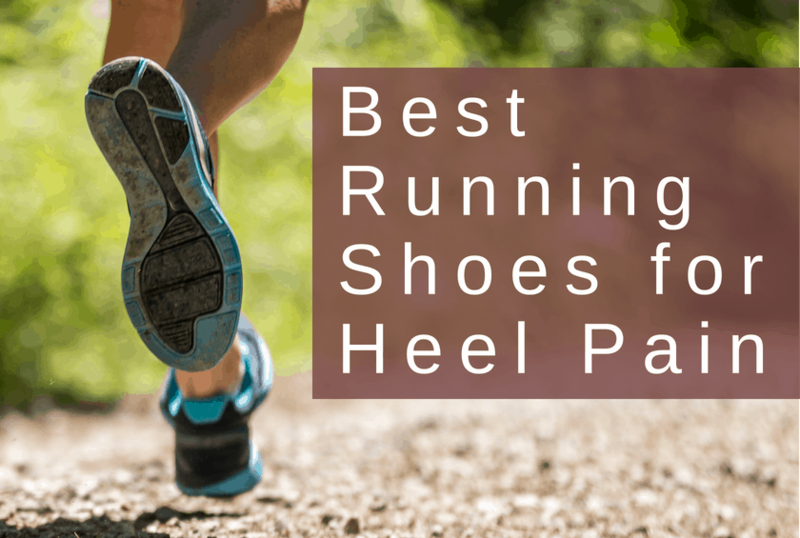 Here, we have a list of the best running shoes for heel pain to help you get back on the track, trail, or road ASAP! The Hoka One One Bondi 6 is one of the most cushioned shoes on the market. It has a full-length midsole of EVA foam for maximum support and comfort along your whole foot. What’s nice for runners with heel pain is the extra cushion found in the heel. Additionally, the Bondi 6 has what Hoka’s describes as a meta rocker frame. This basically means the bottom of the sole is curved for a smooth heel-to-toe transition. Another thing we like about the Hoka One One Bondi 6 is the use of a 3D printed puff frame. The use of this frame promotes breathability in the shoe while providing support and structure to the upper. The tread on the Bondi 6 is also a mix of EVA foam and more durable rubber in spots that tend to wear more. This reduces weight while providing enough protection in spots like the heel that have more contact with the ground. One note, a few runners have complained the soles aren’t durable enough – something to be aware of. Finally, the Hoka One One Bondi 6 is made for durability. The thick rubber outer soles are designed to take as much abuse as you can give them. We don’t know what the lifetime of the shoe is, but good running shoes should last you up to 500 miles. Overall, the Bondi 6s are one of the most cushioned shoes on the market – especially in the heel – making them ideal for runners suffering from heel pain. 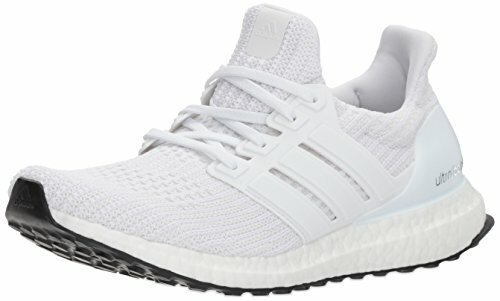 The Adidas Ultraboost is designed to take the majority of energy from your stride and use the specially formulated Boost cushioning to propel you forward. This shoe works best when you’re running at moderate speeds, but it can keep up when you pick up the pace. The toe box could be a bit roomier, but we do like the comfort of the material. The arch support and upper provide ample support, with the upper being made of a sock-like material that helps to cushion the Achilles tendon against repeated rubbing. We like this for runners suffering from heel pain for two reasons. First, it has great cushioning and the Boost foam helps to transform the energy from your running to propel you down the street. Second, it has great heel support while still allowing some freedom of movement to prevent your Achilles from being aggravated. The other nice thing about Boost foam is that it maintains it’s cushioning regardless of temperature. Traditional EVA foam in running shoes gets hard and stiff in cold temperatures and soft and mushy in hot conditions. Boost foam stays the same regardless of temperature. The upper is soft and provides a bootie-like fit without sacrificing support. It does a great job at keeping your feet secure in the shoes. The Ultraboost is not a cheap shoe, but it has a lot of technology to help you run faster and keep your feet protected from the pavement. 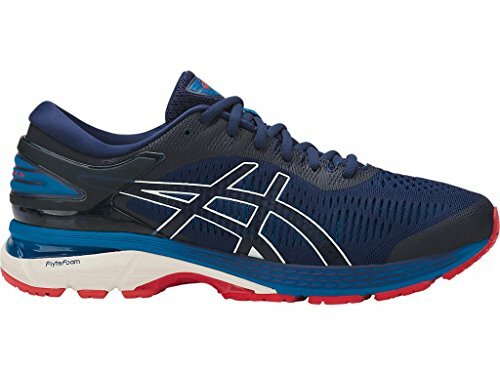 The Gel-Kayano 25 continues the Asics’ tradition of soft, gel cushioning, great support, and snug fit in the midfoot and heel. The plush cushioning and secure heel counter provide support and comfort to runners who have heel pain. The new upper in version 25 provides a breathable and lightweight feel along with a secure fit. The midsole, made of two types of FlyteFoam, Asics new durable, yet light foam, works with the gel cushioning to allow for a smooth turnover while running. One thing we like about this shoe is the support it offers runners who tend to overpronate on each stride. Overpronation can injure your tendons and muscles over time. The sock liner prevents the shoe from rubbing against the Achilles, just like the Adidas Ultraboost. Also, the sock liner is made of natural moisture-wicking materials, preventing the discomfort that comes from excess sweating. The only downsides to this shoe are the weight and price. It can be too heavy to run a short race, so it’s better to use for training and long runs. 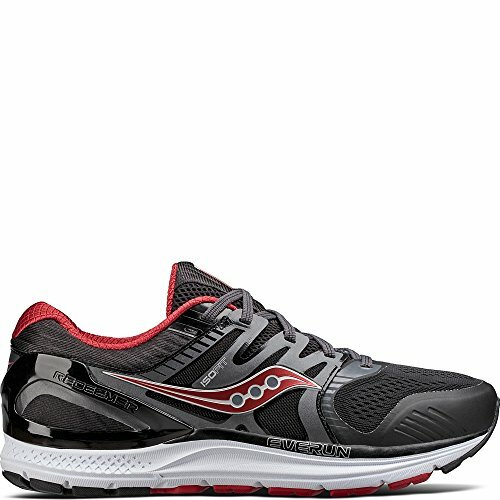 If you need a running shoe with tons of cushioning and support, the Saucony Redeemer ISO 2 is your best bet. The Redeemer has lots of cushioning in the heel, featuring Saucony’s responsive EVERUN foam. And with tons of support, this shoe will help keep your feet aligned correctly. The Redeemer includes a sock-like upper that offers your ankles and legs plenty of support. Without proper support, it’s easy to roll your ankle and cause injury. 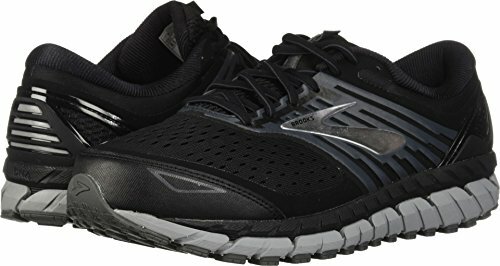 The shoe is versatile enough to be a casual walking shoe or one used for running. The breathable fabric lining and removable mesh insole allow you to customize how your shoe feels when you wear it while providing the most comfort and stability possible. 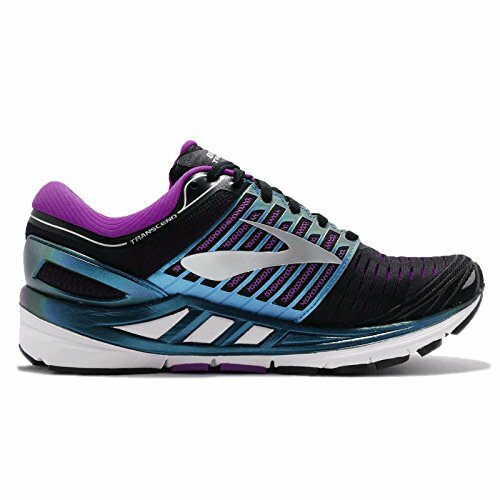 Some runners complained that the shoe lacked the same level of support as prior models, but we didn’t experience that. The other issue we have is the relatively bland design of the shoe. Granted, this may not be an issue for you, but we like to see a little splash of color in our shoes. 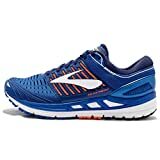 The Brooks Transcend 5 is another supportive and cushioned shoe. It keeps many of the features of previous models in this line. This version, however, has an upgraded upper mesh and a guide rail to give the foot more support than it would have had with other shoes. The highest impact zones, including the heel, receive protection from layers of cushioning that disperse force throughout the shoe rather than at one specific point. The heel of the shoe has more roundness to it, making it smoother to transition your stride from one foot to the next. The stretch mesh does a decent job at molding to the shape of your foot but isn’t perfect. Another big drawback is that this shoe only comes in standard sizes. If you have narrow or wide feet relative to their length, you may have to go up or down a size and lessen some of the benefits from a good fit. This shoe is suited for the long haul. It has a robust rubber outsole with pronounced tread, and it’s wider than previous versions. If you have a narrow foot, you might want to make adjustments, so the shoe fits you properly. The 1080 is New Balance’s plush, cushioned neutral shoe. It provides nice support and cushioning in the heel. And the wide last helps keep your foot aligned correctly. All the standard features of comfort can be found in this shoe: the full-length midsole, the mesh upper for maximum breathability, and the cushioned heel collar for plenty of ankle support. 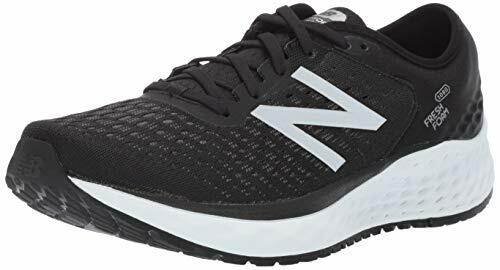 The New Balance 1080v9s don’t seem to be as flexible as other shoes on the market, but this is typical for shoes with lots of cushioning. What the shoe lacks in flexibility, it certainly makes up in traction. You should still be careful if you plan on going for a run in snow or ice, but the rubber tread will give you a little more traction than otherwise. The Brooks Beast and Ariel 18 are designed for runners who severely overpronate or need an extra supportive shoe. This shoe not only has superior arch support, but it has more cushioning than similar shoes and feels great as soon as you put them on. The forefoot and heel have extra rubber on the outsole for added traction. It’s a perfect show for a variety of running surfaces: asphalt, concrete, light dirt, and wet conditions. New to version 18 is a seamless upper that’s comfortable, lightweight, and offers tons of breathability to help keep your feet cool. The mesh on the upper is made to wick away moisture and alleviate excessive sweating. The stiffness of the shoe and its weight doesn’t make it suited for fast runs or tempo work. But it’s great as an everyday trainer or for long runs. The biggest benefit is its unrivaled support and stability in the arch. The added cushioning and high heel-to-toe drop make it well suited if you suffer from heel pain. The Hoka Gaviota is one of Hoka’s softest, most cushioned shoes. It’s ideal for runners who overpronate, but would work equally well for runners with a neutral gait who prefer a more supportive shoe. The outsole is curved in such a way as to propel you forward when your foot contacts the ground. Meanwhile, the wide forefoot provides plenty of support and stability on the ground. The cushioned and narrower heel gives the heel protection and support as well, so you aren’t hurting your heels every time you take a step. The hardened rubber outsoles of this shoe let it work best on hard surfaces. Hand-packed dirt and asphalt are your best bets. 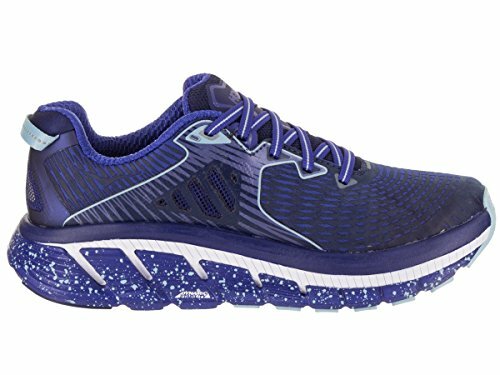 This shoe isn’t quite as cushioned as the Hoka Bondi, but it is a great option if you need additional support. If you have heel pain and mainly run on trails, the Speedgoat 2 is a great option. 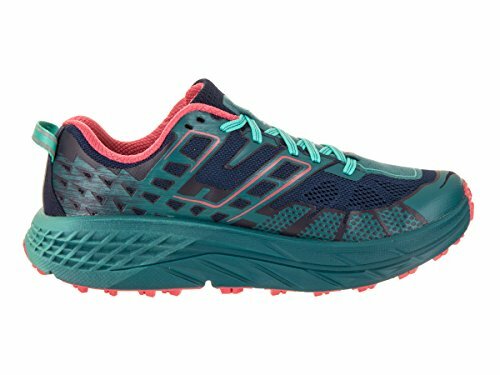 Like all Hokas, it has tons of cushioning and traction for a variety of terrains. Overall, the Speedgoat 2 seems to have a balance of traction, comfort, and stability. The mesh upper hasn’t changed from previous models, so the shoe still breathes well. The shoe is lightweight with Vibram rubber on the sole for added traction. There have been some concerns about durability, but we found them to be fine. Compared to Hoka’s other trail shoes, this is a beefier model. Good for training runs but they work equally well for races or speedwork. The Air Zoom Vomero 13 is Nike’s most cushioned running shoe. It’s biggest selling point is the air cushioning in the heel. When you are suffering from heel pain, you want as much cushioning in the heel as possible. The Nike Air Zoom Vomero 13 tries a new design with its upper. Rather than a mesh knit, it’s a circular knit that is supposed to increase breathability. It does, but only after a while. In the meantime, we got some blisters on our feet. This shoe seems like it takes longer to break in than it should. The Vomero 13 also has a fairly wide toe box, something rare on most Nike shoes. Overall, it’s a nice, all-purpose trainer.